Taste the goodness of Amish life. Bestselling cookbook author and food columnist Lovina Eicher brings together the best of Amish cooking in The Essential Amish Cookbook: Everyday Recipes from Farm and Pantry. Join Eicher as she shares traditional Amish recipes along with her own kitchen tips and secrets. Growing up, Eicher learned to cook and bake at an early age alongside her mother, longtime columnist and Amish cookbook author Elizabeth Coblentz, and has put those skills to use in her own Amish kitchen as she cooks for her eight children. 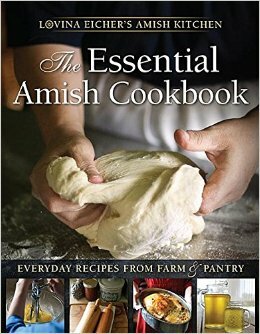 The easy-to-follow, authentic recipes you’ll find in The Essential Amish Cookbook are prepared every day in countless homes in Old Order Amish communities across North America. Many of the more than 100 recipes are richly illustrated with step-by-step photographs to help you learn Amish cooking just as if you were in Lovina’s kitchen. From hearty main dishes to substantial sides—plus a generous sampling of scrumptious cakes, pies, cookies, and other delectable desserts—learn how to make the hearty, simple dishes that the Amish cook together and serve at home, church services, and weddings. In a fast-food, digital world, the book’s colorful photos and conversational tone provide a real taste of Amish life and invite you to slow down. Your family will come to love her Zucchini Chocolate Chip Bread, Rhubarb Juice, Roast Beef with Veggies, Oven Crusted Chicken, pickles, jams, and so much more. Experience the simple joys of Amish life—food, faith and family! I can’t wait to try out Lovina’s Loaded Potato Soup! It looks amazing. May 19 – Better World Books – 6-8 p.m.
May 20 – Barnes and Noble – 12 – 3 p.m.
Lovina Eicher is author of the syndicated column, Lovina’s Amish Kitchen, which appears in 40 newspapers around the United States and on a weekly blog maintain by her editors. She is the author of several cookbooks. Lovina and her husband have eight children and live in rural Michigan.